As Bulgaria heads to the polls on March 26 for snap parliamentary elections, expected to be a tight race, Balkan Insight is bringing you developments as they happen. Polls officially opened at 7am and will close at 8pm tonight. The centre-right GERB of ex-prime minister Boyko Borissov and the centre-left Bulgarian Socialist Patry, lead by Korneliya Ninova, are the main competitors for winning the snap vote. As Bulgarians across the country and abroad head to the polls, check out the key events that led to Bulgaria’s snap parliamentary elections. 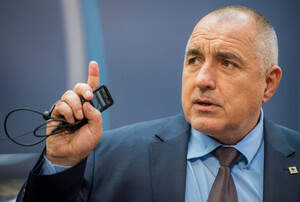 The leader of the centre-right Citizens for European Development of Bulgaria party, GERB, and twice prime minister of Bulgaria, Boyko Borissov, eyes a third mandate as head of Bulgaria’s next government. To find out more about his history and what he stands for, read our profile on him. 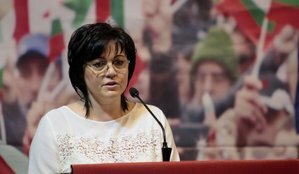 The first-ever female leader of the Bulgarian Socialist Party, Korneliya Ninova, has succeeded to bring new life to her party and turn the Socialists into a real threat to the political hegemony of the centre-right GERB party, led by former PM Boyko Borissov. Get to know her backstory with our profile on her. 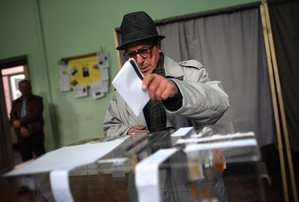 By 10am on Sunday, 8.44 per cent of Bulgarians had voted at the snap parliamentary elections from the over 6.8 million who have the right to do so, the Central Electoral Commission, CEC, announced. A total of 6,810,336 Bulgarians are eligible to vote at 12,081 polling stations in Bulgaria and 371 polling stations in 70 other countries. The chair of the electoral commission in the Bulgarian village of Krushovitsa, northern Bulgaria, was arrested for vote buying on Saturday evening, the Regional Electoral Commission in the regional city of Pleven announced on Sunday, quoted by the Bulgarian National Television. On Saturday evening, the Prosecutor General Sotir Tsatsarov announced that a total of 70 investigations have been launched in relation to the electoral process. 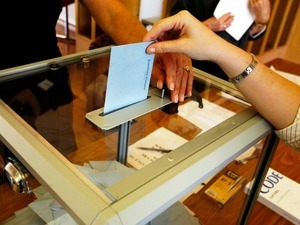 Several investigations have been launched on the voting day, too. The voting in Turkey, where over 450,000 Bulgarian Turks live, started in the early hours of Sunday, with people waiting at long queues since dawn. In contrast to last years' 141 voting stations in Turkey, Sofia decreased that number to 35 for the 2017 parliamentary election, following voting changes adopted in May 2016. Voters are also reportedly complaining that there are not enough voting stations in Istanbul, Ankara and Bursa, where the largest communities of Bulgarian Turks live. 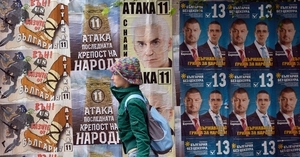 In the lead up to Bulgaria’s parliamentary elections, the populism wave that has been sweeping the globe was also at the centre of the election campaigns of many Bulgarian political parties. The main field of battle in which the parties fought was the country’s education system, with numerous parties making pledges appealing to patriotism among Bulgarian nationals. In her analysis of the political messages being used ahead of the polls, BIRN’s Mariya Cheresheva spoke to Parvan Simeonov, director of Gallup International Bulgaria, who identified three key trends in the electoral campaign - nationalism, socialist inclination and radicalisation of rhetoric. Ahead of today’s polls, Bulgaria raised concerns that its powerful neighbour Turkey was trying to influence the result in favour of DOST, a recently formed ethnic-Turkish dominated party that some call the Turkish President’s “Trojan horse” in Bulgaria, BIRN’s Mariya Cheresheva wrote in an analysis published on March 20. 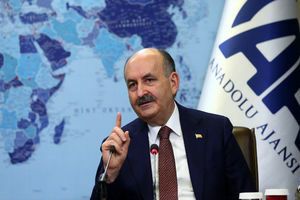 Turkish Minister of Labour and Social Security Mehmet Muezzinoglu called on people to vote for the DOST coalition. Photo: Anadolu Agency. After casting a ballot on Sunday, Bulgarian President Rumen Radev said that he hopes that after all the crossfire and accusations between the rivalling parties in today’s election, he hopes they will show responsibility and make the inevitable compromises to form a government as soon as possible. “I voted with the hope of all Bulgarians for a better, more modern and prosperous Bulgaria,” he said. After he cast his vote on Sunday, GERB’s leader and ex-PM Boyko Borissov called for a stable, united and predictable Bulgaria because of “the problems at the border”, without clarifying further. 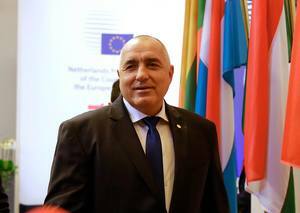 Asked to comment on the worsened relations between the EU and Turkey, Borissov said that “both Europe and Turkey have to make a lot of compromises, this [current] discourse [between them] is harmful for Bulgaria,” he said. However, Borissov quickly moved the conversation to one of his favourite topics – football, preferring to comment on Bulgaria’s victory over the Netherlands on Saturday evening than current political issues in the country. Referring to the game, which Bulgaria won 2:0, Borissov said that “Bulgarians do better when they are underrated”. 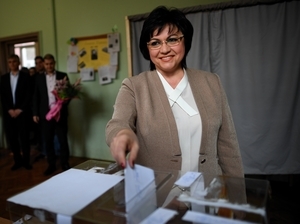 Bulgarian Socialist Party leader Korneliya Ninova voted in Sofia on Sunday. She told journalists that she has voted for change, for security at the Bulgarian borders and people’s homes, for increased incomes and for young people to choose to raise their children in Bulgaria. By 1pm local time on Sunday, 25.31 per cent of the 6.8 million Bulgarians eligible to do so had cast a ballot in today’s parliamentary elections, according to the Central Electoral Commission, CEC. This is 2 per cent more than the last parliamentary vote in 2014. Most of the votes so far have been cast in the Sofia region, where 31.37 per cent of the citizens have submitted their ballot. 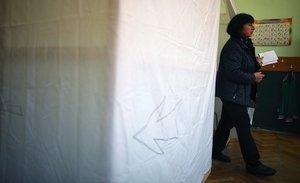 Twenty political parties are competing for the votes of between 3.5 and 4 million Bulgarians expected to cast their ballot in today’s polls, with polling stations closing at 8pm. While the final outcome remains unclear, pollsters have predicted a neck-and-neck contest between centre-right GERB, led by ex-PM Boyko Borissov, and the centre-left Bulgarian Socialist Party, led by Korneliya Ninova. According to Alpha Research’s latest poll, which was published on Thursday, GERB has a slight lead over the Socialists. The Central Electoral Commission has received 17 reports claiming that results from exit polls have been revealed, which is illegal in Bulgaria before voting closes, which will happen at 8pm tonight. However, media in the country largely use their Facebook and Twitter accounts to publish early data from the seven polling agencies that carry out exit polls, as the ban does not cover social media. The published data varies, as media use information from different polling agencies, but they all reveal a close battle of between less than 1 to 3 per cent between the GERB and the Bulgarian Socialist Party, and another three parties - nationalist coalition United Patriots , the ethnic-Turkish dominated Movement for Rights and Freedoms, MRF, and Volya [“Will”] – a new political project of Veselin Mareshki, a businessman. Bulgarian National Radio reported on Sunday that 200 buses carrying Bulgarian voters had arrived from Turkey in time for today’s parliamentary elections – far less than the number Bulgarian nationalists said were on their way. Claiming they had information that some 1,000 buses carrying 50,000 Bulgarian Turks were heading to Bulgaria, Bulgarian nationalists staged their first of a number of blockades on of the country’s border with Turkey on Tuesday to try to stop busloads of Bulgarian Turks coming to vote in today’s parliamentary elections. 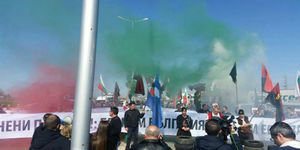 On Friday, Bulgarian authorities safely removed the protesters without incident. In the lead up to the polls, tensions had been growing between Sofia and Ankara, with protesters alleging that the Turkish government was using the Bulgarian expatriates to try push a pro-Ankara party in the polls. Around 38,000 Bulgarians had voted from abroad by 1pm local time on Sunday, with the majority - around 14,000 – having cast their vote in Turkey, Focus Radio announced, quoting Bulgaria’s Ministry of Foreign Affairs. 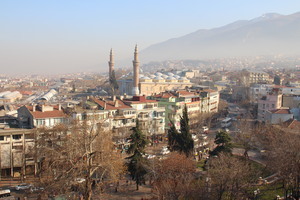 Meanwhile, media reported that there were tensions at polling stations in the Turkish city of Bursa, where there is a large population of ethnic Turks from Bulgaria. There has also been extensive complaints from voters abroad over a new requirement from the Central Election Commission that Bulgarians who vote from outside the country need to fill in a declaration in Bulgarian. Many of the Bulgarian Turks living in Turkey, however, do not know Bulgarian as it is not their mother tongue. Voters have complained of discrimination and deliberate attempts to slow down the electoral process, as many of them cannot fill out the declaration by themselves. Bulgarians living in the German city of Hamburg have also complained about this new requirement. The CEC, however, said that all Bulgarians who use their right to vote have to understand the Bulgarian language and explained that the voting declarations cannot be filled out by third persons for those who do not speak Bulgarian. 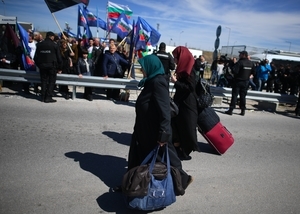 Bulgarian Turks living in Turkey had to cross the Bulgarian-Turkish border on foot on Friday due to border checkpoint blockades by nationalist supporters who were protesting against so-called “electoral tourism”. By 5pm local time on Sunday, 42.74 per cent of Bulgarians had voted in the parliamentary elections, the Central Electoral Commission, CEC, announced. The highest number of votes have been cast in the Sofia region, where half of the eligible voters have cast their ballots. CEC reported that it had received 67 reports of possible violations in the voting process. Voters in Bulgaria have less than an hour remaining to cast a ballot for the elections that will decide on the MPs who will take a seat in Bulgaria’s 44th National Assembly. According to polling agency Alpha Research, over 49 per cent of Bulgarians have already voted, while Gallup International Balkan estimates that voter turnout has been a little below 42 per cent so far. Official results of the votes cast abroad will be revealed on Monday and in the days following. Polls have officially closed for Bulgaria’s 2017 parliamentary elections. 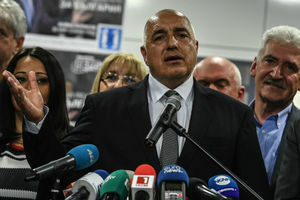 The centre-right Citizens for European Development of Bulgaria, GERB, led by ex-PM Boyko Borissov, has won the snap vote on Sunday according to the first exit polls based on the votes up until 7pm, Bulgaria’s main polling agencies – Alpha Research and Gallup International Balkan – revealed when the polls officially closed. According to Alpha Research, GERB has won 32.2 per cent of the votes, while Gallup estimates that support for GERB was 32.8 per cent, meaning that GERB will have between 86-98 seats in the new parliament. The Bulgarian Socialist Party, led by Korneliya Ninova, came narrowly in second place with around 28 per cent of the votes, which translates to between 75-85 seats in the National Assembly, the exit polls show. Between five and six parties will enter Bulgaria’s 44th National Assembly, exit polls show based on the votes cast up until 7pm – an hour before voting officially closed. 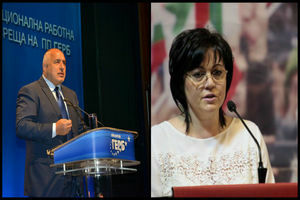 According to polling agency Alpha Research, aside from the two leading parties – Boyko Borissov’s centre-right GERB and the Bulgarian Socialist Party, BSP, led by Korneliya Ninova, four other parties will have MPs in the new parliament – the ethnic-Turkish-dominated party Movement for Rights and Freedoms, MRF, with 9.7 per cent of the votes, the nationalist United Patriots coalition with 9.5 per cent, the new Volya Party by businessman Veselin Mareshki, and the centre-right coalition Reformist Block – People’s Voice, which both received 4 per cent – the threshold for entering the parliament. Based on its exit polls, Gallup International Balkan estimates that five parties will enter the parliament – BSP, GERB, MRF, the United Patriots and Volya. However, Gallup’s pollsters, commented that two parties – the Reformist Block – People’s Voice coalition and the anti-graft “Yes, Bulgaria” coalition, led by former justice minister Hristo Ivanov – finishing under 1 per cent below the threshold, could enter the parliament after official results come in the following days. Whether the new ethnic-Turkish dominated party DOST, led bt Lyutfi Mestan and which has won less than 3 per cent of the votes according to the first exit polls, also remains unclear, as the votes from Turkey will not be counted on Sunday. According to exit polls, his party has won the election with around 32 per cent of the votes. Borissov refused to comment on who will be the potential partners for a future coalition government, calling for the final results of the vote to be revealed on Monday, but expressed hopes that a cabinet will be formed swiftly. 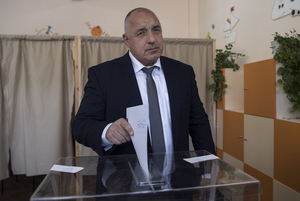 Bulgaria’s 2017 parliamentary elections lived up to expectations of a neck-and-neck race between the two main parties, with exit polls revealing ex-Prime Minister Boyko Borissov’s GERB has nudged ahead of the Bulgarian Socialist Party to claim victory with a 4-per-cent margin. The final official results of the elections are to be announced in coming days, but the exit polls show that five or six parties will enter the next National Assembly. That concludes our coverage of today’s polls in Bulgaria.